VDN (vDinar) is a relatively new regional-oriented crypto currency that has been getting more attention lately. It was CPU-mineable up until recently, though it seems that there is a ccMiner fork available (source) supporting the vCrypt algorithm that the coin uses for mining. The vCrypt algorithm is not entirely new mining algorithm, it is more like a variation of the Scrypt-N algorithm, though you are not able to mine vDinar with regular Scrypt-N miners. Unfortunately there seems to be no binary version of the ccMiner for for Vcrypt, because it seems that the GitHub source of the Veles miner fork of ccMiner is incomplete and many people are having trouble compiling it by themselves. That is why we have compiled a 32-bit Windows binary of the miner with VC2013 and CUDA 8.0, it supports Compute 3.0, 5.0 and 5.2 and should work with pretty much any more recent Nvidia GPU. Do note however that the vCrypt algorithm is pretty heavy on the CPU, so you may have trouble achieving maximum hashrate if you have a slower dual-core CPU like the commonly used Intel Celeron processors for GPU mining rigs. Performance wise you can expect something like 900-950 KHS from a GTX 1080 Ti, 700-ish from GTX 1070 Ti, 450-500 from GTX 1060, but that is only if you have a high-end CPU. With a slower processor such as Intel Celeron G3930 for example you might be getting just a fraction of the actual hashrate, because of the slow processor performance and the miner maxing out the CPU usage. 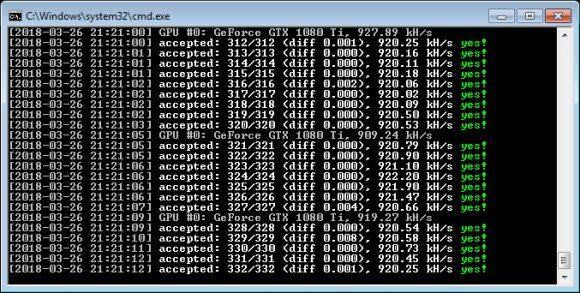 You can try running multiple instances of the miner for better results and also feel free to play around and experiment with different launch settings to see if this might improve the situation with performance and share your findings, but again, have in mind that to get good performance with vCrypt on a multi-GPU mining rig you will need a really high-end CPU. Someone need to fix scrypt NV CPU usage bug….